Where's Donovan McNabb's Contract Extension? When the Redskins traded for longtime Eagles quarterback Donovan McNabb, we assumed that a contract extension was just around the corner. Washington Owner Dan Snyder has never been shy about giving big money to veterans. Plus, ever since the trade the Redskins’ front office praised Donovan McNabb as the new face of the franchise. So what happened? Where’s the extension? I highly doubt that McNabb is to blame here. He wanted an extension with the Eagles, and knows that Snyder’s past suggests that he will be than generous. There’s little benefit to Donovan in putting off discussions. If he performs well the Redskins can designate him their franchise player and keep Donovan indefinitely. Furthermore, McNabb has to know that it is likely his numbers could suffer this year, playing behind a haphazard offensive line and with few playmakers. Or he could get hurt. A year from now Donovan could find himself wandering the NFL free agent market for a one-year starting gig contract. Signing a new extension should thus be at the top of McNabb’s to do list. He has all the leverage from being anointed by the Redskins’ brass as the quarterback of the present and future. He’s coming off a great season which will be difficult to replicate in Washington. Plus, with this team Donovan gets to visit Philadelphia every year. So if it’s in McNabb’s interest to sign a long-term deal, why hasn’t it been accomplished? Despite their rhetoric, the hesitation has to be on the Redskins. The team’s rationale reflects all the same reasons McNabb wants a new deal: the Redskins have less leverage to negotiate right now. However, if Bruce Allen and Mike Shanahan can wait into the season, they can see if Donovan is the guy they want to hitch their wagons to over the next 3-5 years. 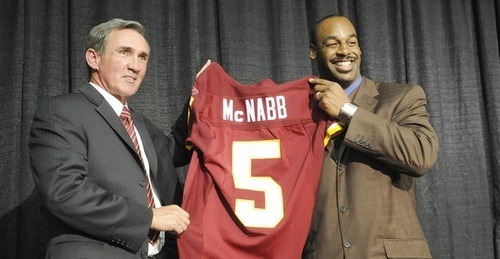 Washington paid a high price to get McNabb, but there’s no reason to double down quite yet. If McNabb can’t lift an otherwise mediocre team to a winning season, or if he gets hurt, the team might be better off finally gutting the team and rebuilding from scratch — something they resisted doing this offseason. If everything works out, the team runs the risk of alienating McNabb, their fans, and having to pay Donovan more. But considering McNabb’s track record and public image, he is unlikely to bring his concerns to the media. The potential downside to not striking a quick deal is outweighed by the Redskins’ desire to make sure they don’t make a long-term mistake. Tagged with Donovan McNabb, Contract Extension, Washington Redskins, Philadelphia Eagles, Front Office, Negotiations, NFL, 2010 Season, Offseason, Long-Term. July 29, 2010 by Brian Solomon.